For the university’s main commencement ceremony, graduates should arrive behind McMahon Hall at 8:45am and find the “Nursing” sign. They will process in two lines, in any order. For this first ceremony, the graduates may sit with friends. Graduates are expected to wear their cap and gown and carry their hoods on their left arm. Wear your tassel on the right while processing in. 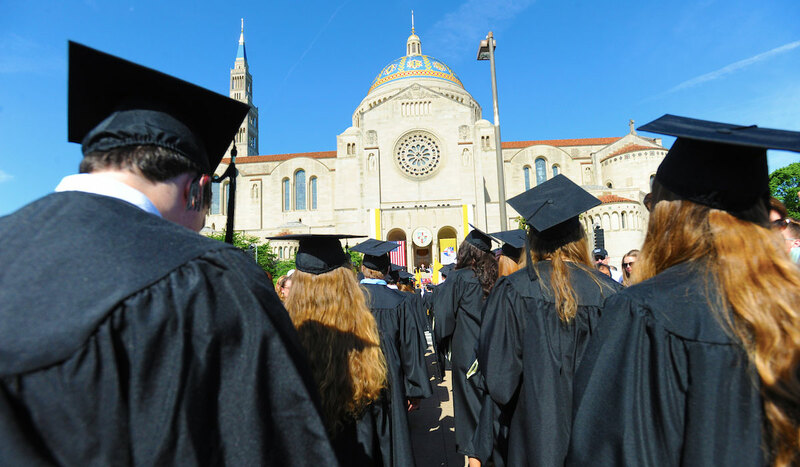 The School of Nursing Diploma Ceremony starts immediately following the main ceremony in the Upper Church, Basilica of the National Shrine of the Immaculate Conception. The pinning ceremony is a long-held tradition in the School of Nursing. The School of Nursing pins are distributed to our graduating seniors.